America’s earliest surviving photograph was made here about Sept. 25, 1839. 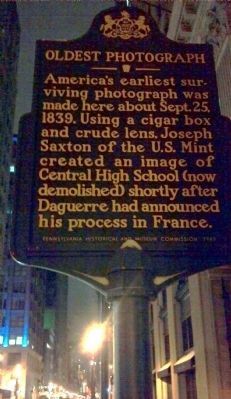 Using a cigar box and crude lens, Joseph Saxton of the U.S. Mint created an image of Central High School (now demolished) shortly after Daguerre had announced his process in France. Location. 39° 57.045′ N, 75° 9.773′ W. Marker is in Philadelphia, Pennsylvania, in Philadelphia County. 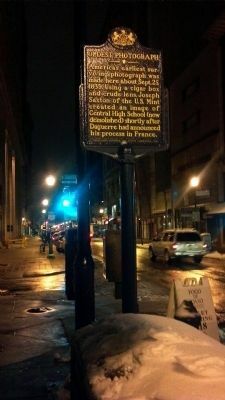 Marker is at the intersection of Chestnut Street and South Juniper Street, on the right when traveling north on Chestnut Street. Touch for map. 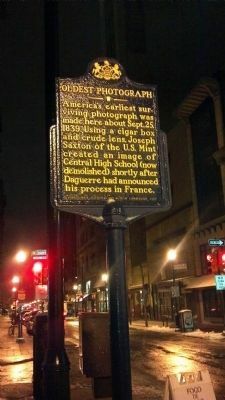 Marker is at or near this postal address: 1337 Chestnut Street, Philadelphia PA 19107, United States of America. Touch for directions. (about 500 feet away); Artillery Corps Washington Grays (about 500 feet away); Mother’s Day (about 600 feet away); Brigadier General Smedley D. Butler (about 600 feet away). Touch for a list and map of all markers in Philadelphia. More. 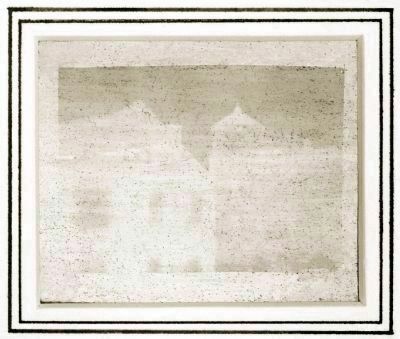 Search the internet for Oldest Photograph. Credits. This page was last revised on June 16, 2016. This page originally submitted on January 30, 2012, by Keith S Smith of West Chester, Pennsylvania. This page has been viewed 554 times since then and 15 times this year. Photos: 1, 2, 3. submitted on January 30, 2012, by Keith S Smith of West Chester, Pennsylvania. 4. submitted on January 30, 2012, by Michael Kindig of Long Beach, California. • Bill Pfingsten was the editor who published this page.